Make your Christmas cake look extra special with smooth icing and a frosted leaf and berry garland. To ice the cake, warm the jam with 1 tbsp cold water in a small pan, then sieve. Put the cake on a board and brush with the jam. Knead the marzipan to soften, then roll out thinly to make a 40cm round, dusting with icing sugar if it starts to stick. Drape the marzipan over the cake and press to cover, trimming off any excess around the base. Use the same technique to cover the cake with the fondant icing. To frost the herbs and berries, place the egg white and sugar in separate bowls. Using a small pastry brush or clean paint brush, coat the rosemary leaves, edges of the bay leaves and half the cranberries with the egg white. Sprinkle with sugar and shake off any excess. Leave to set in a cool place. 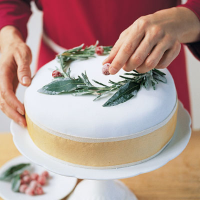 To finish arrange the frosted rosemary, bay leaves and cranberries into a wreath on the top of the cake. Tie a ribbon around the cake to finish . Remove the decorations before eating. Before you ice and decorate your cake you could ''feed'' it to make it even more moist, indulgent and rich. Prick it all over with a skewer once, then drizzle with brandy every 2 weeks for 2-3 months. The cake will keep in an airtight tin for 2-3 months before decorating. Find the recipe for this delicious cake here. This recipe was first published in November 2005.